QSC has set the standard for powered PA loudspeakers with their industry-leading K series and KW series. With 1000 watts of room-filling sound and smart onboard DSP to help you get the most out of those watts, it's no wonder these PA speakers are huge hits. And the QSC KW153 loudspeaker is no exception. KW153s make killer main PA speakers in high-SPL, long-throw applications. Pair them with subs in the corners of dance clubs. Set them up as side-fills on large stages. With these speakers in your rig, there aren't many gigs you can't handle. Each KW153 weighs 87 pounds, with handles placed at just the right height to make them portable. The only three-way loudspeaker in QSC's K family, the QSC KW153 has dedicated drivers for high, mid, and low frequencies: a 1.75" HF compression driver, a 6.5" midrange cone, and a 15" woofer for the lows. The KW153's 15-inch woofer cone digs down to a thunderous 35 Hz, while the dedicated midrange horn reinforces the real star of your mix: the vocals and instrumental solos. Since these speakers boast a frequency response all the way down to 35 Hz, you're that much less likely to require dedicated subs. Like the other loudspeakers in the QSC K and KW series, the KW153 is a powered, active speaker with 1000 watts of lightweight Class D amplification. These speakers' built-in Class D power amps employ QSC's Guardrail limiter to prevent destructive clipping distortion and woofer over-excursion, while a virtually silent internal fan turns on when the amp senses high temperatures -- making the KW153 truly robust. To get impressive bass output from 1000 watts, all Ks and KWs employ DEEP: Digital Extension and Excursion Processing. Flip the DEEP switch on the back of your KW153, and this virtually transparent limiter kicks in to increase the average output of bass frequencies. Much more than just a low-frequency EQ boost, DEEP employs sophisticated DSP to identify and limit brief low-frequency transients while preventing distortion. The QSC KW153 lets you control high frequencies with application-specific EQ settings. Set the HF switch to "Flat" for full-range music, or "Vocal Boost" for increased intelligibility and presence for speech or vocal reinforcement. In addition, QSC's Intrinsic Correction EQ implements FIR linear phase filters to adjust the KW153's response, helping deliver consistent sound over the entire audience. While QSC's smaller K series speakers project sound in a cone-shaped pattern, KW series speakers like the KW153 project an axis-symmetric pattern with a more square cross-section. In plain English, the KW153 lends itself to being grouped in a cluster of 2 or more speakers, because the square pattern edges match up with each other -- helping to blanket a larger venue in consistent sound. When you're working with a frequency response as wide as the KW153's (35 Hz to 18 kHz), physics prevents the loudspeaker's coverage pattern from being contained to an extremely narrow angle. Still, the KW153 disperses sound over a well-contained 75-degree coverage angle, which makes them a great candidate for cluster applications. Building on the success of QSC's K Series, the KW153 represents the next evolutionary step in wood enclosure loudspeakers. QSC system engineers have created the KW153 to feature all the groundbreaking electronic attributes of QSC's popular K Series while at the same time designing a product that is both smaller and significantly lighter than previous wood enclosure models. Like K Series, the KW153 features a QSC designed, 1000 watt (2 x 500) Class D power module. And continuing in the K Series tradition, the KW153 is fitted with the identical high-output 1.75" HF device and woofers of the same high quality design. Intrinsic Correction, first featured in our high-end line array products maps 65-75 spatially-averaged measurements to IIR and FIR filters that actively adjust time, frequency and amplitude response to a maximally flat bandpass target. The result is a speaker that behaves equally well across the entire sound field. GuardRail(tm) protection, first introduced on our GX Series amplifiers protects both the amplifier module and your performance from unnatural and destructive clipping. The KW153 features a four-position mic / line gain switch that allows for connection of a wide variety of devices. Combo XLR and 1/4" TRS inputs accept both mic and line level input while a set of RCA phono inputs allow additional connectivity to portable MP3 players, CD players and line-level mixers. Up to three audio sources can be mixed internally and summed to a balanced output for "daisy-chaining" of multiple units. Separate direct outputs are also provided on each channel for additional output flexibility. Remote gain control capability is offered via a potentiometer (not included) connected to the on-board Phoenix-Style connector. In an installed application, multiple KW153 speakers can be "daisy-chained" for total gain control from a single remote pot. Auto-standby mode is engaged after 5 minutes of inactivity. The KW153 is designed to withstand the rigors of professional use. Advanced construction processes, premium-grade Baltic birch cabinetry, ergonomic, cast aluminum handles, and a highly protective steel grille provide for ease of transport and long term durability. Integrated M10 suspension points allow for flown applications with a KW M10 KIT (sold separately). "You're gonna love this speaker!" Sound: This one speaker sounds better than my two sp2's, running @ 1200 watts each and my jbl 600w sub put together! Feature: The "Deep" feature is awesome! It also has a lot of connection options. Ease of Use: It took less than 10 min to read the instructions and get going. Quality: Very solid speaker. Sure, it cost about $1,400 but it looks, sounds, and feels like it too. Value: Simply put, you get what you pay for and this speaker is worth every penny. Quit thinking about it. Just do yourself the favor and buy it. Manufacturer Support: Haven't dealt with them yet but I've heard great things about customer support and they have a really long warranty if you register your product, which is really easy to do on their website. The Wow Factor: This thing looks & sounds "pro". I've had a ton of compliments about the sound and look of this speaker. Overall: I just hope that this speaker lasts a long time cause I'm really impressed with everything about it. I looked at a lot of speakers before finally buying these and I'm glad that I didn't go with my first choices. 45 of 46 people (97.83%) found this review helpful. Did you? Sound: I was blown away! Not being used to having a 6.5 in driver for the high mids in the cabinet I was a little nervous about getting these but now that I've used them my mind has certainly changed. These 3 ways boxes are fantastic and very transparent through out the freq spectrum, And when you add subs you now have a four way system! Feature: The deep switch is fantastic! 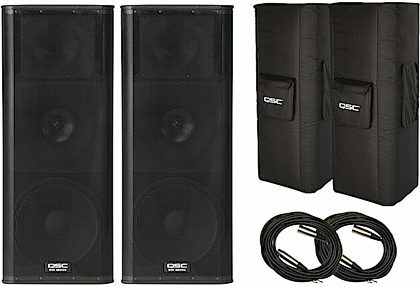 I usually use a dual 18" cabinet underneath these but ran into a situation where the venues ceiling was to low for me to use my Subs. So i just used these as the main's and had the deep switch on wich allows these cabinets to reach down to 40hz. They seriously sounded like i had my subs at the venue. Amazing! Only feature that i don't like and would like to see them add is a simple locking xlr connector for the inputs. Ease of Use: Very simple! I used them for a gig the very night i recieved them in the mail! As far as live sound goes i havn't even come close to pushing these cabinets to the max I've always have had plenty of head room when crossed over at 100hz now when the deep switch is on you get close to that limiter engaging from the constant bass boost. Quality: Very durable, nice solid birch cabinets but are still light enough for me to pick them up and place them on my subs without a second person! Value: I'd personally like to see the price come down a little so i can afford to buy more. But that being said, as far as other company's similar product's you do get what you pay for. Cheaper isn't always better. These speakers are worth every penny in my eyes! Manufacturer Support: Havn't needed to contact the company. The Wow Factor: Great Look! Great Sound! Plenty of options on the amplifier to meet any audio situation! WOW! Overall: My newfound love! I've been a professional live engineer for about 11 years doing this as a full time job! I run a AV company doing anywhere from small bar/ wedding gigs to gigs over 5,000 people, I really wanted to write this review because when I bought these speakers there were only DJ reviews on it. So when i purchased these i was quit nervous about buying them blind for a live band situation and not being able to test them first. But I took a chance in the mind set that dj's usually push speakers to the limit considering it's a constant signal driving the speakers.